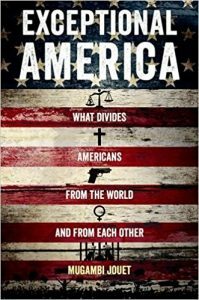 Exceptional America: What Divides Americans from the World and from Each Other is the type of book where you have to laugh in order not to cry when reading. Mugambi Jouet systematically explains how Americans are born and raised into an anti-intellectual culture where harsh incarceration practices, Christian fundamentalism, gun violence, and a plutocratic economic structure controls the lives of average citizens. Jouet explains that Alexis de Tocqueville was not referring to American exceptionalism as a simply positive characteristic, but that America was exceptional in its uniqueness. Being one of a kind has positive and negative qualities in terms of society and governance. For instance, conservative America’s fundamentalists belief in the Christian God, and the End Times, fuels the far-right wing belief that the United States can do no wrong in foreign policy and even domestically. On a positive note, most Americans perceive themselves as classless; or at least part of a broad middle class, where the industrious can get ahead and egalitarianism is encouraged. Towards the end of the book, Jouet touches on the rise of authoritarian nationalism which is rising around the world, citing the election of Trump, and the National Front’s influence in France. Jouet is very smart, and informed about many nations’ politics and culture, yet he either does not have the inclination or the background to connect the problems of American ignorance, religious fundamentalism, market neoliberalism, and imperialism back to our system of ever-increasing exploitation and inequality due to capitalism. Jouet offers the tepid liberal trope that Americans, if better educated, should and will accept a social democratic system, citing Sweden and Japan as models where wealth inequality is relatively low and standards of living and general happiness are high. Unfortunately, although Jouet acknowledges that “social democracy will not lead to utopian societies in America, Europe, or elsewhere”, his mild call for what some refer to as a “New New Deal”, while laudable, will fall on deaf ears. American political leaders, the “elite”, are mentally unfit for office (see Trump, Donald) and are not prepared to listen, take advice, or think rationally, just as in the start of the book, his judges were not willing to heed his well-reasoned argument for a reduced sentence for his defendant. This article was posted on Wednesday, July 26th, 2017 at 8:06pm and is filed under Book Review, Donald Trump, Economy/Economics, Media, Militarism, Nationalism, Neoliberalism, Prison Industry, Propaganda.